Founder of the association Couleur Garance (1998) and of the Botanical Garden of Dye Plants (2002) in Lauris. A French national born in Morocco, Michel Garcia established the Couleur Garance to connect ecologically sensitive artisans with the expertise of an older generation of dyers. In 2002 Michel founded the Botanical Garden of Dye Plants at the Château de Lauris, which would later grow to add an international forum and market for natural dyes and a resource centre. In 2006 Michel handed over leadership of Couleur Garance so that he could further pursue his interest in colour and dye techniques. He has published three books on natural dyes showing the range of shades available and how to obtain them. 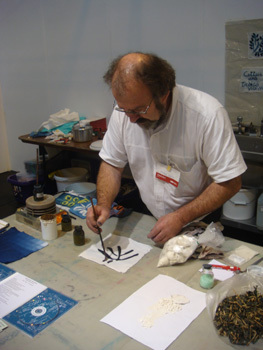 Michel is a botanist, chemist, natural dye specialist and philosopher.